This is the final blog on breathing pattern disorders and presents the main ideas that represent how my clinical practice has changed with regards to treatment. Before I started studying BPD more closely, I always thought that treating breathing meant teaching patients to breath through their abdomen and not their upper chest. But as you may have picked up from the previous blog - both techniques can be done in an ideal or unideal manner. “Fundamental to breathing rehabilitation is a need for the individual to understand - even in basic terms - the association between how breathing is carried out, and health in general and symptoms in particular.” (Chaitow, 2004., p.181). What this quote reinforces is the power of education and knowledge in patient treatment. It reminds me that that the first step in treatment is educating the patient on how breathing should occur. This is my adapted education that I give to patients. There should be enough time and comfort at the end of each breath to stop and pause - in fact, most people who breathe normally, can hold that pause for up to 30 seconds before feeling the need to breathe in again. If patients want to and need to spend time focussing just on breathing (not breathing during exercise) then I would recommend the Buteyko Breathing Diary. It is a free online resource that sequentially helps patients to relearn normal breathing over the period of 3-4 weeks. What I really like about the Buteyko breathing exercises is that it trains nasal breathing techniques, breath holding techniques and breathing timing techniques. The link above is to a self-directed journal of exercises. There is also an entire chapter in the textbook I read about this treatment approach. I was particularly interested in reading the Physiotherapy treatment chapter and comparing what material was presented to my personal approach. Interestingly the main approach presented included retraining breathing, establishing an regular cardiovascular exercise regime and sleep hygiene. There was no mention of manual therapy techniques for the thorax and attaching muscles or therapeutic exercises for breathing and the diaphragm. This is presented in the Osteopathic chapter. While I recognise that these chapters are written by different professionals and demonstrate their personal approaches rather than a exact representation of the profession, in reinforces to me that physiotherapists aren’t seen as people who treat breathing disorders in an outpatient setting. Yet, I think we have so much to offer! The manual therapy techniques which I use the most where learnt from continuing education courses hosted by the Postural Restoration Institute and my favourite is the manual release technique for pectoralis major, minor and subclavius. Just be mindful of your hand placement in female patients when working on the ribs and subclavius - you'll notice that my weight is through the ulnar portion of my palm and my thumb is lifted. The technique above uses a constant pressure while the patient breaths in and out, using the dynamic movement of the rib cage to change the pressure of the treatment. Below is an alternative soft tissue release technique. Before and after these treatments I evaluate resting breathing, shoulder active range of flexion in standing, and passive range of glenohumeral external and internal rotation in 90 degrees abduction. This allows me to understand the impact soft tissues have on movement of the ribs, thorax, scapulohumeral rhythm and glenohumeral rhythm. There are many other soft tissue structures that may limit movement of the thorax and information regarding these structures will come from the remainder of your assessment of spinal range of movement, shoulder range of movement, palpation and muscle strength/length assessment and other special tests. The three treatments discussed below are a sample of the key exercises that I commonly use. It is not an exhaustive lift by any means. I have selected one balloon-assisted exercise, one upper body and abdominal wall strengthening exercise and one stretch. 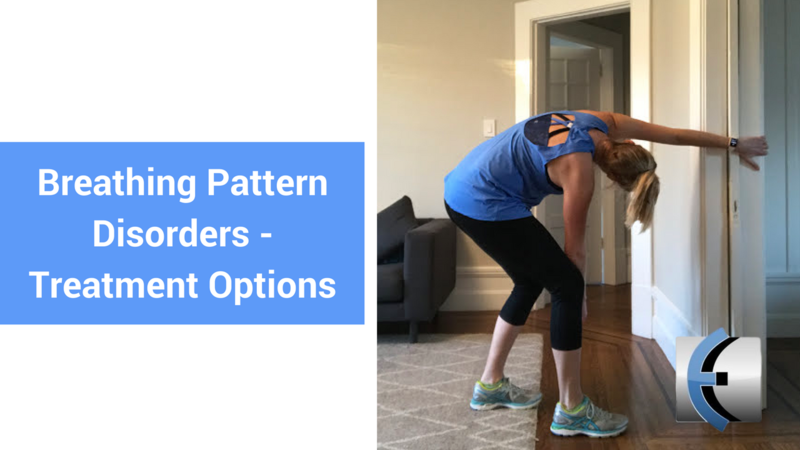 I'm sure each practitioner has their own preferences for therapeutic exercises, and I have found that these three areas are often deficient in patients with breathing disorders. Planking is a great strengthening exercise for retraining breathing in a weight bearing position. The key finding I look for in quadruped is how well a person can position their scapula on the thorax. More importantly, as they exhale, if the ribs drop down towards the table the scapula will wing off the thorax (seen in image 3). If this occurs the patient is not able to stabilise their upper body while in a static position and this exercise will be a great starting point for rehabilitation. Planking is just the beginning of my strengthening training. I normally check for technique on knees before moving to a full plank. My patients need to be able to sustain the correct posture for 30 seconds without dropping through their rib cage and winging their scapulae before I would progress to more difficult variations. I feel this stretch often goes hand in hand with patients who need to release the soft tissue structures at the front of the chest. It targets soft tissue structures at the back of the shoulder, the lats and other muscles which have direct insertions into the ribcage. Thumbs down is always best but you can vary the amount of leaning back or twisting under the arm pit to modify the stretch until it feels best. Once in a stretch position make sure you can still breathe in fully and exhale fully without being blocked by the stretch sensation. I've found that chasing a moderate stretch allows for better outcomes through breathing, than an intense stretch. If this exercise is too advanced there some other bilateral variations include child's pose, or child's pose with a foam roller. Breathing disorders do exist and after often under-diagnosed and poorly treated. While there is a variety of ways to assess and quantify breathing - there should always be a reason driving what you choose. For example, are you looking at technique, rate of breathing, psychological influences, physiological influences, or, are you just observing to see how breathing may connect with the primary musculoskeltal complaint the patient presents with? Treatment is always going to be directed by what is found during the assessment, and therefore always the hardest part of the blog to expand on. Including education about normal breathing is paramount for retraining breathing patterns. Considering the soft tissue structures attaching to the thorax and how they impact movement of the shoulder girdle is important for optimising movement and choosing exercises. Breathing can be treated in isolation or as a part of other therapeutic exercise. And remember, people don't just choose to develop a breathing pattern disorder. It is our job to understand why this has occurred and then implement strategies for correction. Take time to understand the individual in front of you before making changes to how they breathe.